If you play Hearthstone on a regular basis, you will have heard that, in conjunction with the new expansion and the introduction of play formats, Blizzard Entertainment is revising several cards in existing sets - mainly, so far, the Basic and/or Classic sets (the sets that will never get removed from Standard format). Now, in theory cards could be revised to be more or less powerful or effective. In practice, so far they are made less powerful. In gaming circles, the phenomenon of reducing the power level of a game component (whether a card, a player's special ability, or other playing piece) is known as "nerfing", an homage to Hasbro's Nerf line of products. So, let's look at how Blizzard has swung the Nerf bat at Hearthstone, shall we? The reasons for some of the nerfs were revealed today, when Blizzard revealed a batch more cards for Whispers of the Old Gods. We'll get to those later. 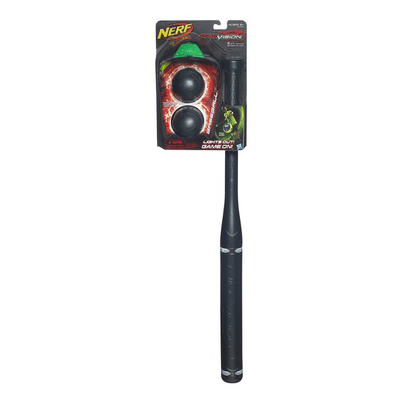 A Nerf bat. Image credit: Hasbro. The druid class was especially hard hit by the recent changes. Altogether, three class cards were affected. What's more, they're not marginal cards, but core part of many (if not most) druid decks. Ancient of Lore is a really strong play: for 7 mana, you got a 5/5 body (an admittedly weak statline for 7 mana) and either some healing or some card draw, using the druid's class-exclusive "Choose One" mechanic. In short, on its own merits, Ancient of Lore will no longer necessarily an auto-include in any druid deck that wasn't an aggro deck. In fact, you're probably better off playing something else that's more mana-efficient, whether it's a bigger minion for 7 mana, or cheaper card draw (such as Nourish). How does this affect the card? I won't say it's unplayable in Standard, but it can no longer fit its original niche. Druid decks that flood and buff the board may still find the effect valuable - 6/6 for 5 mana is decent, and it works well with Knife Juggler and buff spells. Other druid decks, though, will probably not have any more room for it. The Keeper of the Grove is, up until its alteration, an excellent 4-mana minion. You get a 2/4 body, and the option of either silencing a minion or dealing 2 damage. It's often a way to take out minions such as Knife Juggler, or neutralise buffed minions and Taunts. While Keeper of the Grove is much more fragile, it's not clear that it's going to become a questionable inclusion. If you're looking strictly for a silence effect, then Keeper of the Grove is now outclassed by Spellbreaker, another 4-mana minion. If, however, you still want the flexibility offered by the Keeper of the Grove, it will still be an auto-include in your deck. Blade Flurry is a key part of most rogue combo decks, and it's not hard to see why: you buff your weapon, take a swing (or two, if you're using something like Assassin's Blade), then you both clear the board and lacerate your opponent's face (possibly with a double tap after hitting their face with your buffed weapon before the Flurry). Basically, it goes from being a "hit everything" card, for only 2 mana, to being a board clear card for 4. Given the buffs you can get (at least in Wild), it's still a decent play, because you get to clear the opponent's board while preserving yours. By way of comparison, the biggest board clear spell, Flamestrike, deals 4 damage to each enemy minion, for 7 mana. While you'll have had to spend mana to equip and buff a weapon, you're likely to do 3+ damage to each enemy minion for 4 mana, and still get a swing with the weapon in. In short, combo rogues will still run this. It just won't be as fast a play as it was before. Hunter's Mark is an easy, cheap way to get that big, enormous Taunt giant out of the way, or knocking off key enemy finshers such as Ysera, by reducing it's Health to 1. Sure, it's not as cheap anymore, but at 1 mana it's not a significant enough change to reduce this card's playability. It might make some hunter combos more difficult in early turns, but expect to see this card still in any aggressive hunter deck you face. A rogue card that, strictly speaking, didn't need nerfing on its own merits (because it hardly saw play anyway), this card gave another minion Stealth. This was great as a permanent effect for minions you wanted to sit around and just do stuff for you (mana discount like Thaurissan, card draw engine like Gadgetzan Auctioneer, card-generating finisher such as Ysera). Master of Disguise is becoming a 4-mana Finicky Cloakfield that happens to leave a 4/4 body behind. Because this card rarely saw any play of late anyway, it's not a very significant change. What makes it significant is the context of the various minions being released as part of the new expansion, many of which have powerful turn-over-turn triggered effects. Basically, had Master of Disguise been left to its own devices, it may well have become utterly overpowered in combination with the newly-introduced minions. As it is, it's probably going from "hardly sees any play" to "hardly sees any play". So, yeah. In its pre-nerf form, Arcane Golem is a "mini-finisher", a useful tool for ending the game for aggressive decks: pop down an Arcane Golem for 3 mana, maybe spend 1 more mana to buff it, and swing at the opponent's face. The cost, if it became relevant, was to ramp up the opponent's mana curve, allowing them to field bigger and more minions and/or heal themselves. What's happening to Arcane Golem? If there is a card we've looked at that is being nerfed out of play, it's this one. The extra 2 Health simply does not make up for losing Charge and keeping the opponent-buffing battlecry. Aggresive decks wanting some final bit of burst will have to save their dust for something like Leeroy Jenkins. I don't see this changing the card's use much. Sure, 5 mana for a 4/2 body and removal isn't as valuable, but it's still good enough. Big Game Hunter will still be a one-of (or, if we see a slower metagame with the release of Whispers, even a two-of) in pretty well every deck. What I think will be a crucial difference is that the higher mana cost constrains your options for what to play alongside it. Ironbeak Owl is a key part of many aggressive decks, because it's used to bypass Taunt or other significant minions. At 2 mana for a 2/1 body plus the silence effect, it's packed with value (even if a 2/1 body is pretty weak for 2 mana). This could change Ironbeak Owl's frequency of use. It's going to depend on each player's answer to the question of whether they just want a solid silence effect attached to a mana-efficient body (in which case Spellbreaker will become the de facto silence card in a deck), or whether the lower mana cost is key to enable additional card play during a turn (in which case Ironbeak Owl will still see some use in such decks). The Knife Juggler is one of the iconic aggressive-deck minions. It's triggered effect can be used devastatingly if properly set up. Alternately, it's such a key early minion that it can be used to bait out removal. And with all those knives and a 3/2 body for 2 mana, it's a valuable piece of work. The change to the Knife Juggler has some significance, as it can no longer just trade with large swathes of 3- or even 4-mana minions. But its knife-throwing properties are key to the card, and as these are unaffected, the Knife Juggler isn't going anywhere. Another mainstay of aggressive decks, the Leper Gnome packs an efficient 2/1 body and a fantastic deathrattle into a 1-mana cost card. What's happening to the Leper Gnome? I won't say the change makes it unplayable, as the deathrattle is still valuable. But in its old configuration, it traded with lots of early-game minions, and now it doesn't. The fastest of rush decks might still run Leper Gnome without a second thought, but other aggressive decks will have to consider whether it's better to have a minion capable of contesting the board than to have the extra face damage. Molten Giant is the card that makes control-style warlocks tick. It's pretty easy to life tap your way down to low life, play these for cheap (or even free), and then Taunt up with a Sunfury Protector or Defender of Argus. How is Molten Giant being altered? Whether or not the Molten Giant remains playable will depend on how much efficient healing warlocks have. In Wild, where Antique Healbot is still in play, I don't anticipate that the extra cost will be a big problem. In Standard, it might. So there you have it - a summary review of the myriad ways in which several cards are getting nerfed. Now, back to your regularly scheduled Whispers of the Old Gods card reviews, especially since Blizzard revealed a big pile of cards just today.